Sometimes big surprises come in small packages. This is the case with the new scenario based card game Conflicted. 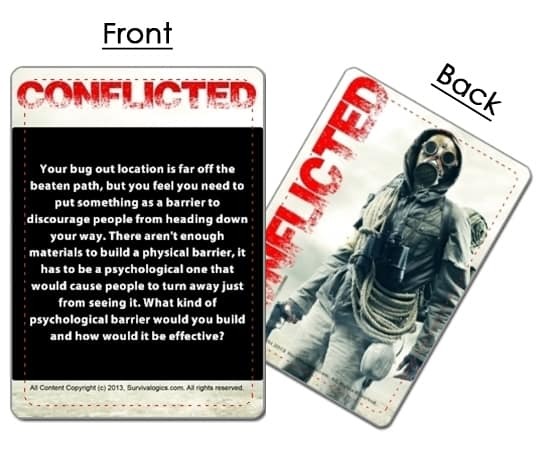 Conflicted, created by SurvivalLogics, contains 52 scenario cards and 2 rule cards. Unlike reading preparedness articles for a “how-to” react in a certain scenario, Conflicted gets you to think through how YOU would respond to a myriad of survival situations after a SHTF event. But the game isn’t just an individual mental exercise. The game developers and many who have already purchased the card game are seeing the advantage of “feeling” others out in their families or preparedness group. For instance, SouthernPrepper1 recently did a video review of Conflicted and recounted how it helped to reveal the way a new member might react when the balloon goes up. Watch the short video. When we are all faced with tough situations, we have an idea of how we are going to act. We tend to think this idea is the way most reasonable people would act as well. The problem is that another person in your prepping group also feels the same way, about a completely different answer to the same question. So depending on how seriously you want to play the game with the other players you can really get into some great discussions and get a feel for what kind of person your friend or family member “really” is before you both are faced with a difficult situation and emotions are running high. Or you can go completely in a different direction and play the game casually with someone who isn’t into prepping at all and then we’re sure that at the end of the gaming session that person will be thinking about becoming a prepper themselves. Most questions arent about the scenario itself, but are about the choice that needs to be made. Where do you and others around you draw the line between your own survival versus your morals? The game will raise an awareness regarding other areas of prepping that perhaps you didnt think about. Practice your barter, negotiating and leadership skills. Realize that the only thing that keeps us in line is a world of illusions and once that is taken away, the great majority of people will default back to their animal instincts. Play the game as seriously as your group can handle, or as casually as you want to introduce someone new to the concept of prepping. See what kind of person you really are when you need to chose between life versus your own moral compass. This is how I plan on using the game. Every week or so, my family has a “family night.” We mostly get something to eat and watch a movie or play a game. I plan on using it with my family to talk about certain scenarios, mold my boys on certain actions and keep the overall subject of preparedness in the back of everyone’s mind. I also plan on using this in my men’s church group. We get together every so often to discuss a book or just go out to eat and go to the movies. I plan on using the game just to get some discussion going other than politics or sports. We are all preparedness minded, some more than others. I also plan on using one or two cards as ice breakers whenever I can get away with it. Conflicted can be purchased from the official website. At $14.95 a deck, the price and learning opportunities are way worth it. To purchase Conflicted – CLICK HERE. Can you think of any other ways to use Conflicted? Or share your evaluation of the game. I learned of the Conflict cards based on a you tube clip that Southern Prepper 1had produced and was interested in the discussion that my group would have as we went through the deck. First let me say thanks to Southern Prepper 1 and the maker of the Conflict cards, what an eye opening experience and learning experience for us all. We never discussed the what if concept until the other night. I was pleased to hear that we all felt the same way and would react to the same if the situation came up. I highly recommend the conflict cards to new and old preppers. Its time to understand where you and your group stand when confronted by a problem.